Three-point, Checklist, Malignant, Melanoma, Pigmented basal cell carcinoma, Benign Three point checklist – cite! Three point checklist (message) Three point checklist – participate! In 2003, during the Virtual Consensus Net Meeting on DermoscopyThe examination of [skin lesions] with a 'dermatoscope'. This traditionally consists of a magnifier (typically x10), a non-polarised light source, a transparent plate and a liquid medium between the instrument and the skin, and allows inspection of skin lesions unobstructed by skin surface reflections. Modern dermatoscopes dispense with the use of liquid medium and instead use polarised light to cancel out skin surface reflections. (CNMD) a simple algorithmIn mathematics and computer science, an algorithm (Listeni/ˈælɡərɪðəm/ AL-gə-ri-dhəm) is a self-contained sequence of actions to be performed. Algorithms can perform calculation, data processing and automated reasoning tasks., called three-pointThis glossary term has not yet been described. checklistis a type of informational job aid used to reduce failure by compensating for potential limits of human memory and attention., was established to distinguish malignant [i.e. melanomaThis glossary term has not yet been described. and pigmented basal cell carcinomaThis glossary term has not yet been described. (BCCAbbreviation for Basal Cell Carcinoma)] from benignis any condition that is harmless in the long run pigmented skin lesions. Asymmetry in structure and/or in color in one or two axis of the lesion. The contour shape of the lesion does not impact on the symmetry. Atypical networkNetwork with increased variability in the color, thickness, and spacing of the lines of the network; asymmetrically distributed; gray color, defined as pigmented networkThis glossary term has not yet been described. with thickened lines and irregular distribution. Blue-white structuresThis glossary term has not yet been described., namely any white and/or blue color visible in the lesion, including blue-white veil, scar-like depigmentationArea of white that is whiter than surrounding normal skin (true scarring). It should not be confused with hypo- or depigmentation due to simple loss of melanin. Shiny white structures and blood vessels are not seen in areas of regression., and regression structuresThis glossary term has not yet been described. such as pepperingGray dots. In 2004 Soyer et al. demonstrated that the three-point checklist had a diagnostic value in screening procedure also when used by non expert. In their study, six non-experienced dermoscopists after a 1-hour introduction to the three-point checklist were asked to evaluate 231 clinically suspicious lesions using this algorithm. Finally, the non-experts were able to identify malignant pigmented skin lesions with a sensitivityThis glossary term has not yet been described. of 96% and a specificityThis glossary term has not yet been described. of 33%. The pilot study was followed in 2006 by a larger one performed by Zalaudek et al. in order to revalue the preliminary results. The study was open both to experts and non-experts in dermoscopyThe examination of [skin lesions] with a 'dermatoscope'. This traditionally consists of a magnifier (typically x10), a non-polarised light source, a transparent plate and a liquid medium between the instrument and the skin, and allows inspection of skin lesions unobstructed by skin surface reflections. Modern dermatoscopes dispense with the use of liquid medium and instead use polarised light to cancel out skin surface reflections. who, after a short web-based dermoscopy training, evaluated dermoscopy imagesA representation of a person, animal or thing, photographed, painted or otherwise made visible. of 165 skin lesions following the aforementioned algorithm. The results showed good inter-observer reproducibility with a kappa value of 0.53, sensitivity of 91% (not influenced by the observers’ experience) and an overall specificity of 72% for malignancy (significantly influenced by observers’ skills). 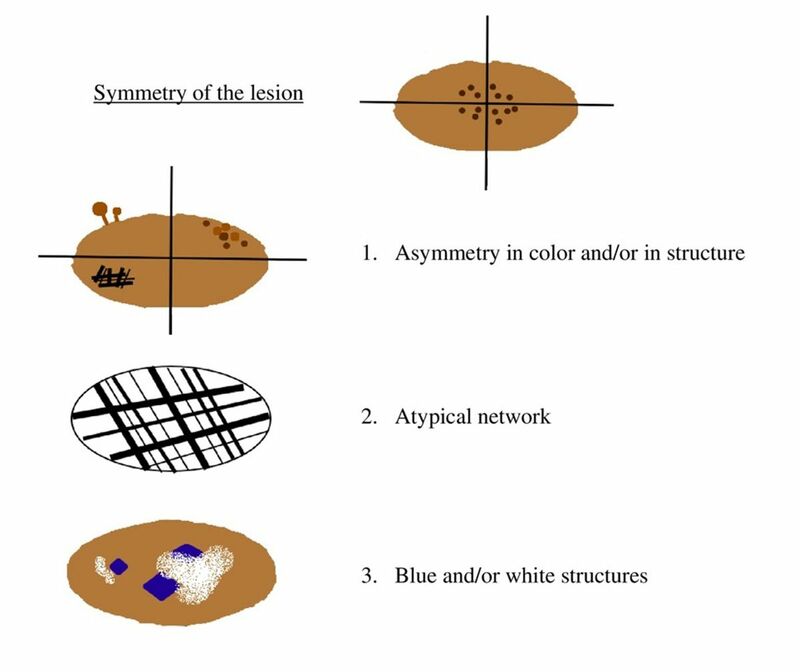 The best predictor of malignancy was asymmetry followed by the blue-white structures and atypical network. In order to improve skin cancerThis glossary term has not yet been described. screening and educational campaigns, one of us in 2006 tested in a prospective study if the adjunct of dermoscopy to the standard clinical examinationThis glossary term has not yet been described. of primary care physicians (PCPs) could improve the accuracy of skin cancer triage. After 1-day training course on dermoscopy, PCPs in Naples and in Barcelona were randomly assigned to the dermoscopy evaluation arm or naked-eye evaluation arm. 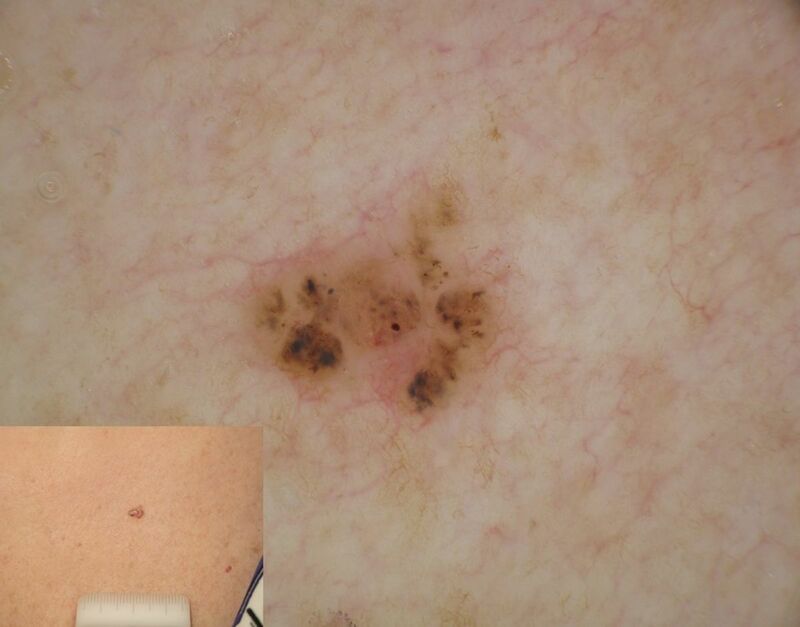 During a 16-month period, 73 PCPs evaluated 2522 skin lesions in their clinics and scored them following the three-point checklist criteria. All patients were revalued by expert dermoscopists. SensitivityThis glossary term has not yet been described., specificity, positivity and negative predictive values were calculated for both arms. Significant differences were found in term of sensitivity and negative predictive value (p=0.002 in the naked-eye evaluation arm; p=0,004 in the dermoscopy evaluation arm). In conclusion dermoscopic criteria had shown to improve the ability of PCPs in skin cancer triage and to reduce useless expert consultation. However, further studies are necessary to define new dermoscopic algorithm allowing to easily distinguish also non-pigmentedThis glossary term has not yet been described. skin lesions such as amelanotic melanomatype of skin cancer in which the cells do not make melanin and non-pigmented BCC. ↑ Argenziano & Soyer: Dermoscopy of pigmented skin lesions--a valuable tool for early diagnosisis the identification of the nature and cause of a certain phenomenon. Diagnosis is used in many different disciplines with variations in the use of logic, analytics, and experience to determine "cause and effect". In systems engineering and computer science, it is typically used to determine the causes of symptoms, mitigations, and solutions of melanoma. Lancet Oncol. 2001;2:443-9. PMID: 11905739. ↑ Argenziano et al. : Dermoscopy of pigmented skin lesions: results of a consensus meeting via the Internet. J. Am. Acad. Dermatol. 2003;48:679-93. PMID: 12734496. DOI. ↑ Soyer et al. : Three-pointThis glossary term has not yet been described. checklist of dermoscopy. 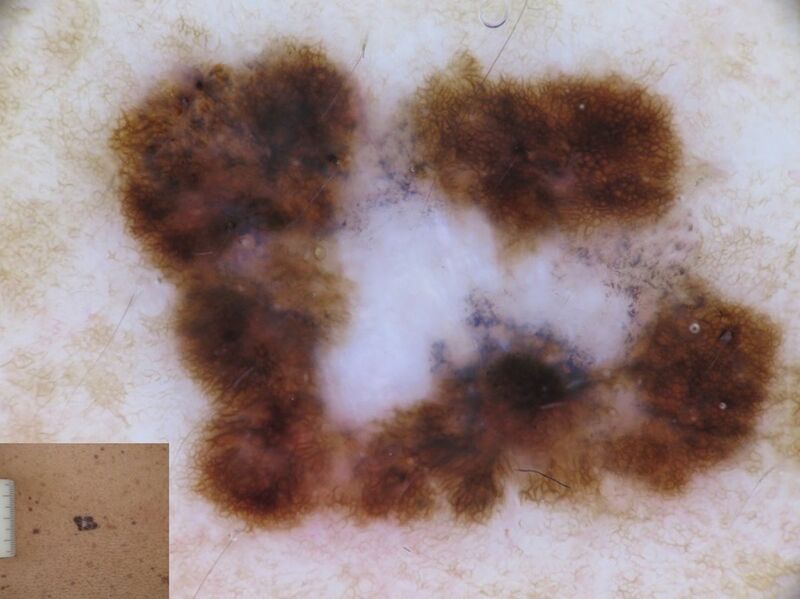 A new screening method for early detection of melanoma. Dermatology (Basel) 2004;208:27-31. PMID: 14730233. DOI. ↑ Zalaudek et al. : Three-point checklist of dermoscopy: an open internet study. Br. J. Dermatol. 2006;154:431-7. PMID: 16445771. DOI. ↑ Argenziano et al. 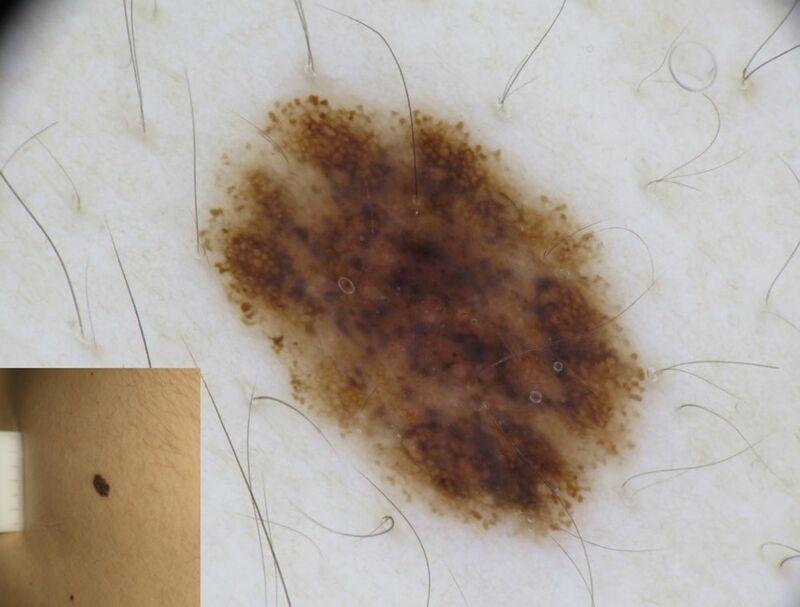 : Dermoscopy improves accuracy of primary care physicians to triage lesions suggestive of skin cancer. J. Clin. Oncol. 2006;24:1877-82. PMID: 16622262. DOI. This page was last modified on 5 March 2018, at 20:19.